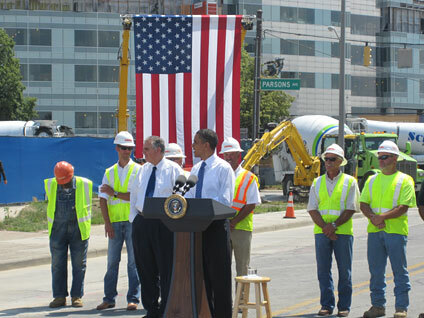 COLUMBUS, Ohio - Trumpeting the 10,000th road project funded by his Recovery Act, President Obama borrowed two of three words made famous in March by Vice President Biden. This is a "big....deal," said Mr. Obama, pausing for effect between the two words between which Biden had inserted an expletive in an overheard whisper three months ago. "Today I return to Columbus to mark a milestone on the road to recovery," the president said. "That's worth a big round of applause." The White House staged the event here in the political battleground of Ohio, where Democrats face tough congressional races this fall, including a fight to win the U.S. Senate seat being vacated by the retiring Republican George Voinovich. Flanked by construction workers in helmets and yellow safety vests, Mr. Obama tried to score political points via the many jobs programs funded by the Recovery Act. "More than 100,000 Ohioans are at work today as a result of these steps," he said. But even before Air Force One landed here, Republicans were trying to put their own spin on the president's visit. House GOP Leader John Boehner, who represents Ohio's 8th Congressional District, said the administration's stimulus program has fallen short of its promises. He cited new numbers from the Ohio's Department of Job and Family Services that showed the state's unemployment rate "remained above 10 percent for the 14th consecutive month in May:"
The White House yesterday launched a campaign called "Recovery Summer," in conjunction with thousands of new jobs programs funded by the Recovery Act being initiated. But Boehner portrays the campaign as bogus. "This will be no 'recovery summer' for the more than 100,000 Ohioans who have lost their jobs since the 'stimulus' was enacted," he said in a written statement meant to undermine Mr. Obama's visit. In his brief remarks delivered in the middle of a street closed for his appearance, Mr. Obama asserted the recession is easing. "Our economy, which was shrinking by six percent when I was sworn in, is now growing at a good clip, and we've added jobs for six out of the past seven months in this country," he said. But at the same time he said he was "under no illusion" that the recession was over. "There are still too many people here in Ohio and across the country who can't find work; many more can't make ends meet," he said. The project he came to spotlight is funded by $15 milllion from the Recovery Act to rebuild roads in the area around Nationwide Children's Hospital. The White House says the program will create over 300 construction jobs. Mr. Obama spoke for just ten minutes and was on the ground in Ohio for just over an hour. And though his appearance was billed as official and not political, he did use his remarks to deliver attaboys to some of the Democratic politicians here including the Governor, who is up for re-election. "You also got one of the best governors in the country in Ted Strickland," the president said at the start of his remarks. Strickland faces a challenge for his job in November from former GOP Congressman John Kasich, who was not at the Recovery Act event. Neither was Boehner. The trip Columbus probably cost taxpayers between $500,000 and $1 million. Air Force One alone bills out at $100,000 per hour, and the round trip is nearly two hours. Adding to the cost are military aircraft to carry limos and secret service vehicles, Marine One on standby, Secret Service, local police and other factors.